I didn’t make it to the barn on Tuesday because we were getting blizzard-like weather and roughly a foot of snow. It continued until Wednesday afternoon and they had all the main roads cleared. BO told me they had plowed the road the barn is off of but I know they usually don’t salt or plow it more than once. One does not simply leave one’s lame horse at the barn for more than 24 hours if there’s a chance your tiny car can make it. Nibbles met me at the gate and we walked through 3 foot snow drifts into the barn. She wanted to stick her head in the snow on the way on. Memories of growing up on the snowy hills of Montana? Idk. Got her in and right away I notice her legs look much tighter. Thaw out my hands and brush her off. Check her legs: no heat. I try not to celebrate. I haven’t trotted her out yet. The vet told me I should be hand walking her given her tiny turnout space (which is intentional until he sees her). So I threw her cooler on and brought her in the indoor. After a couple laps at the walk, I took a deep breath for the moment of truth and started to jog…. And she was completely sound. Angels sang. Or was it my bank account? Either way, I did it again. Still sound. Of course, I’m firing off texts to my mom and friends I’ve been lamenting to. (Everyone does that, right?) I guess I was paying too much attention to my phone because Nibbles nipped my hand and gave me the Mare Stare. Princess hadn’t had enough pampering yet I suppose. That or she takes her hand walking very seriously. I’m definitely keeping the appointment for Monday and I’m going to play it safe and continue hand walking only until then. God knows I can wait a couple more days to make sure a professional declares her good to go. Best case scenario, he signs off and chiros her. Crossing everything he doesn’t see something that makes me gulp. I’ve calmed down since Saturday when it initially happened. I had a pretty icky ride on Thursday and intended to ride Friday… only we ended up having 35mph winds so I didn’t. Our lesson that night was canceled. I was definitely riding Saturday, although a series of unfortunate events prevented me yet again from seeing my horse in the daylight and I made it out there at almost 8pm. I was supposed to have a lesson Sunday to make up for the miss on Friday. Here’s the setup to help explain the situation and what I think happened. Nibbles has been in a tiny quarantine pasture since she arrived on 2/12. That’s standard protocol for 10 days which I appreciate. Temperatures were actually above freezing last week which means the ground became extremely muddy extremely quickly. Not ideal, but I figured she only had a couple more days left and she’d be introduced to the small mare herd. On Saturday, it was 55 degrees and sunny. Lately, if it hit 35 degrees, that’s considered a heat wave. One of the barn owner’s children (their family lives on the property) decided to ride his mini dirt bike around the horse pastures. Let me stop there. Does anyone else have an issue with that? Because I do. I understand, you live there, your kids want to play outside… but in what universe is it a good idea to ride a dirtbike in and around horse pastures? So apparently the barn hands saw this and saw Nibbles running around her paddock. Mind you, this paddock is tiny so she really couldn’t canter more than 4 strides fenceline to fenceline. Again, we have several inches of mud. What’s more, the kid continued to ride his bike and my horse ended up slipping and falling in the mud. No one called me, no one checked her as far as I know. I get there at 8pm and bring her in to the cross ties. At this point, I have no idea about the dirtbike or running or slipping. No one has said anything to me. She was a little sluggish but not lame so no alarms were going off. Like I always do, I check her legs. 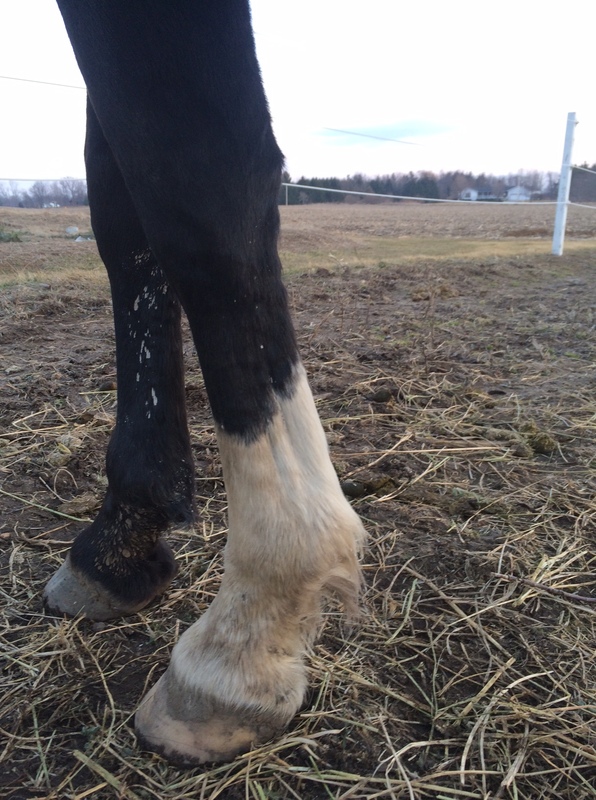 Three legs are warm and have minor swelling. No bows or malformations but clearly inflamed. It’s at this point the barn hand (who is a young girl, maybe not even in high school yet) tells me about the dirt bike and the slipping. I’m dumbfounded. My husband came with me to the barn so I had him trot Nibbles out for me. She was sound albeit a little pokey. It was cold at this point and there is no indoor washrack so I opted to rub her down and have them bute her. Needless to say, I didn’t ride or even lunge her. I put her back out in her tiny pasture although I wasn’t happy about it. I go out on Sunday afternoon after an extremely busy morning. I bring her in and her legs are slightly cooler and definitely less swollen. So much so that I honestly thought maybe I’ll do some in-hand/lunge work today because I didn’t come dressed to ride. I bring her into the indoor to hand walk and my heart sinks. She has a head bob. Not bad, but you can definitely see it. The BO was in there cleaning up and agreed with me; she saw it too. I’m bummed and unwilling to put her back out in the mud. The BO says I can put her in a different quarantine pasture. This one is bone dry, has virtually no grass, and has no run-in. Not ideal but was better to me than 6-8″ of mud. I slathered her in Sore No More and put her back out (mind you, she’s on 24/7 pasture board). I asked them to give her another gram of bute with her breakfast and explained I would be back out on Monday after work to check her. I told her that if she was still off, I would be calling the vet. On Monday evening after work, I check her again. Swelling is almost non-existent, head bob is gone at the walk but present ever so slightly at the trot. 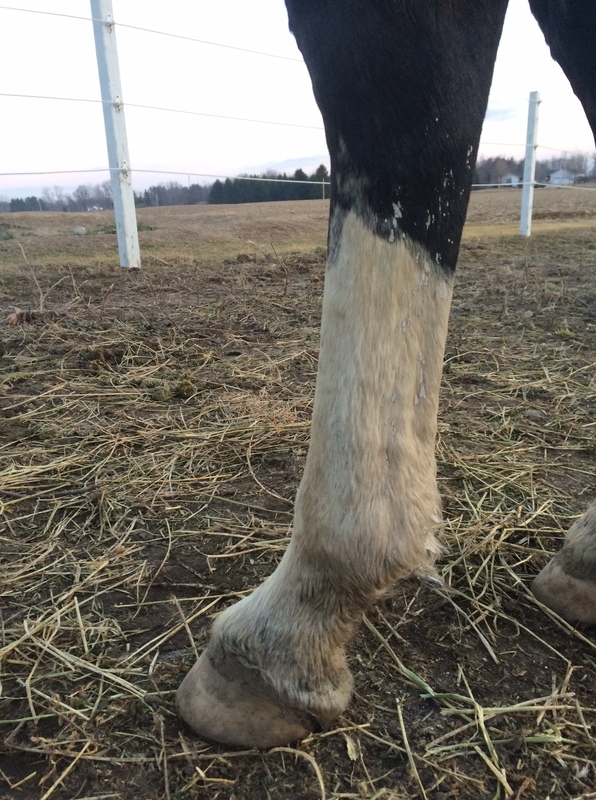 I slather her once more in poultice and decide to go ahead and call the vet. I highly doubt she’ll even be off by the time he gets here next Monday but I explained the situation. I wanted to have him out to adjust her anyway so I need the appointment even if she’s sound by then. Am is it unreasonable to think dirtbikes should not be a thing in close proximity with horses? Of even if they are, if you see horses running, shouldn’t you be stopped by the adult who should be supervising you?